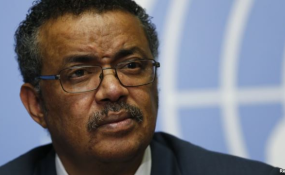 Now Tedros Is Boss, What Significance for Africa? Dr. Tedros Adhanom Ghebreyesus speaking at a press conference in Geneva launching his candidacy to head the World Health Organization (WHO). On May 25, 1963, Africans gathered in Addis Ababa to create the Organisation of African Unity, the precursor to today’s African Union. It stood tall in the minds of Africans who decided to unite for a common cause. It demonstrated our ability to set aside differences in order to make the world a better place. Now, on 1 July 2017, Dr. Tedros Adhanom Ghebreyesus of Ethiopia will stand at the helm of the the World Health Organisation with the ambition to reform, transform and make global health and agile partner of economic transformation for the world. Dr. Tedros’ historical election marks a turning point in Africa’s ability to speak with one voice. Fourteen years ago, in 2003, Africa put forward four candidates for the same position. In disunity, we failed. But just like Washington, Brussels and New York, we turned Addis Ababa into the centre of African political and economic decision-making. The emergence of Dr. Tedros and his victory a WHO are telling tales of an Africa that is taking centre stage strategically by building consensus in Addis Ababa. For example, Africans defined a strategy for the Sustainable Development Goals’ negotiation through the Common African Position. We shifted the paradigm and the world took notice that Africa, in the midst of the challenges, has public sector leaders and diplomats that are harnessing data to inform policies. Furthermore, the African private sector is partnering in the transformation as it made clear during the Ebola outbreak. Ultimately, Africa is becoming a stronger partner to the world because it has developed an internally agreed framework for the negotiations with the world. It is in this context that I see Dr. Tedros’ victory as an African victory. The seeds of 1963 germinated, but the first real bloom will appear on July 1 when Dr. Tedros formally assumes office at the WHO headquarters. I feel confident that Dr. Tedros is the right person at the right time to lead the transformation of the WHO. He has experience beyond health leadership and understands that health permeates all levels and areas of governance in Africa and beyond. Former U.N. Secretary General Kofi Annan broke a glass ceiling for Africans in international organizations. But Dr. Tedros is the first African politician to be succeed from outside UN the system. This is a big step forward. In crafting an African victory, Ethiopia learnt from the challenges of previous African ministers of health. As a former Ethiopian Minister of Foreign Affairs, Dr. Tedros wove his narrative into local, continental and global health diplomacy. Not only did he lead the transformation of community health delivery in Ethiopia, he was instrumental in leading public private partnerships as Chair of The Global Fund to Fight AIDS, Tuberculosis and Malaria. His victory with 133 votes, beyond his personal achievements is an expression of the changing nature of intra-African political relations. We are making progress and we should acknowledge the work of African public servants in spearheading transformation in Addis Ababa and in 55 African capitals. Furthermore, given Dr. Tedros’ central role in key negotiations - such as the third international conference on financing for development (FfD) - he has the critical understanding of issues beyond health to draw new human and financial resources to make his mandate (better health for all) successful. He has the leverage to make health a priority in countries where diseases continue to arrest economic development or in places where viral threat create global issues as we saw with Ebola in 2014. The achilles’ heel in this African victory is African’s ability to provide new resources for WHO under Dr. Tedros to show that we can solve African and global health problems with African resources. With his election, he just reached the beginning of the road, the farthest any African had ever reached, by embracing diversity and taking others along. Dr. Tedros will need cash and competency as member countries contribute less than third of its $2.2 billion budget. Dr. Tedros will require African resources to transform aspirations into tangible achievements so that we fund our unity and strengthen our forefathers’ foundation. Ultimately, it is the moment for Africa’s middle class to step forward and we cannot blink, even when our tax reforms are delayed, limiting our ability to contribute like those in the middle class in the Americas, Asia, Australia and Europe. In 1963, the search for unity prevailed. In 2017 an African backed by an entire continent convinced the world of a victory that appeared, at first, impossible. Dr. Tedros’ success is for the world. He neither went fast nor went alone. Once the dust settles, African’s ability to shift the burden of responsibility from Overseas Development Assistance will be what makes Dr. Tedros’ victory a historic moment. Copyright © 2017 The Aspen Institute. All rights reserved. Distributed by AllAfrica Global Media (allAfrica.com). To contact the copyright holder directly for corrections — or for permission to republish or make other authorized use of this material, click here.